There is a ruby-throated hummingbird that lives in the neighbor’s tree. That’s an assumption, of course; I don’t know where it lives, but every morning I see it perched on the highest twig, surveying its domain, watching for errant pigeons to dive bomb. He (I’m assuming it’s a he, who knows?) disappeared for a while when the weather turned cold (cold being a relative term here in southern Arizona.) I worried he’d left us, but he’s been back for a while, buzzing around the little tree where he lives and dodging in and out of the huge mesquite in another yard in the neighborhood. We become attached to what’s familiar. 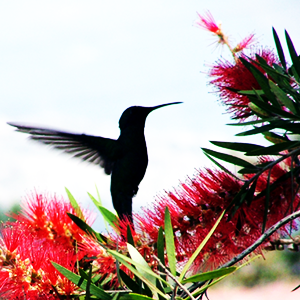 Thoughts, like that little hummingbird, flit, buzz, hover, dive, soar, disappear, return. After while, we accept our frequent thoughts as truth. When they serve us, motivating or comforting, that’s a good thing. What about when we tell ourselves we’re not good enough, when we tell ourselves that The Other is somehow lesser than us, or too different to be accepted? Don’t believe everything you think. Go ahead and believe in hummingbirds, though. That’s fine. I believe in hummingbirds! I believe! I do believe! And Yes – Do Not believe everything ya think!